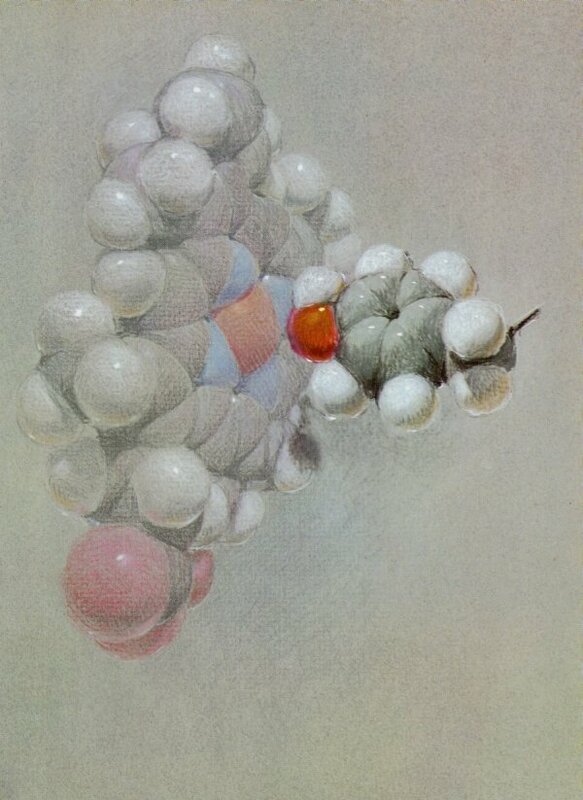 Pastel drawing of the hemoglobin molecule by Roger Hayward, 1964. 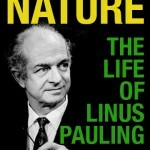 Part of the beauty of studying the life and work of Linus Pauling is that doing so often affords the opportunity to look at how the science of today has developed from questions that were once unanswered and widely debated. One such question was how hemoglobin, the protein in red blood cells, binds to and releases oxygen as it is inhaled and carried to the body’s tissues. 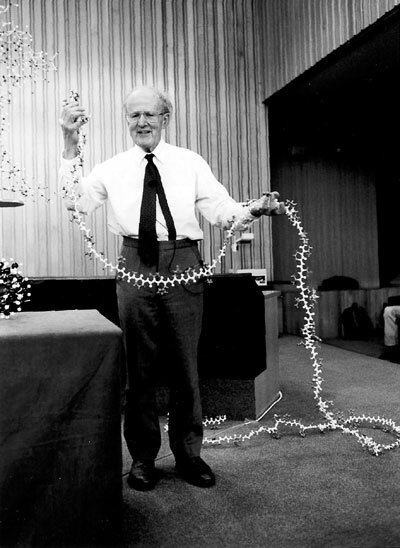 In 1959, Max Perutz used x-ray crystallography to obtain an image of oxyhemoglobin, a hemoglobin protein bound to an oxygen molecule. This was a major breakthrough in many ways. For one, it allowed chemists to observe an image of a three-dimensional protein found in humans for the first time. The imagery also provided tantalizing hints about the specific chemistry that might explain oxyhemoglobin’s structure. We were like explorers who have discovered a new continent, but it was not the end of the voyage, because our much-admired model did not reveal [hemoglobin’s] inner workings. 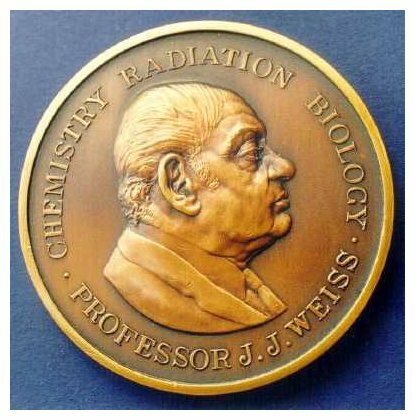 The Joseph Weiss Medal, which commemorates his work as a radiation chemist. 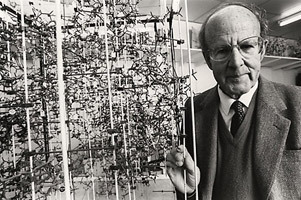 Perutz’s work naturally incited biochemists to further explore the structure of hemoglobin. While it was known that the oxygen-carrying heme group in hemoglobin is composed of nitrogen, carbon, and an oxygen-binding iron, there was much debate over what kind of bond could cause the union and dissociation of these elements. In 1964, Joseph Weiss, a professor at Newcastle University in England, attempted to answer the question of what specific bond forms between iron and oxygen. 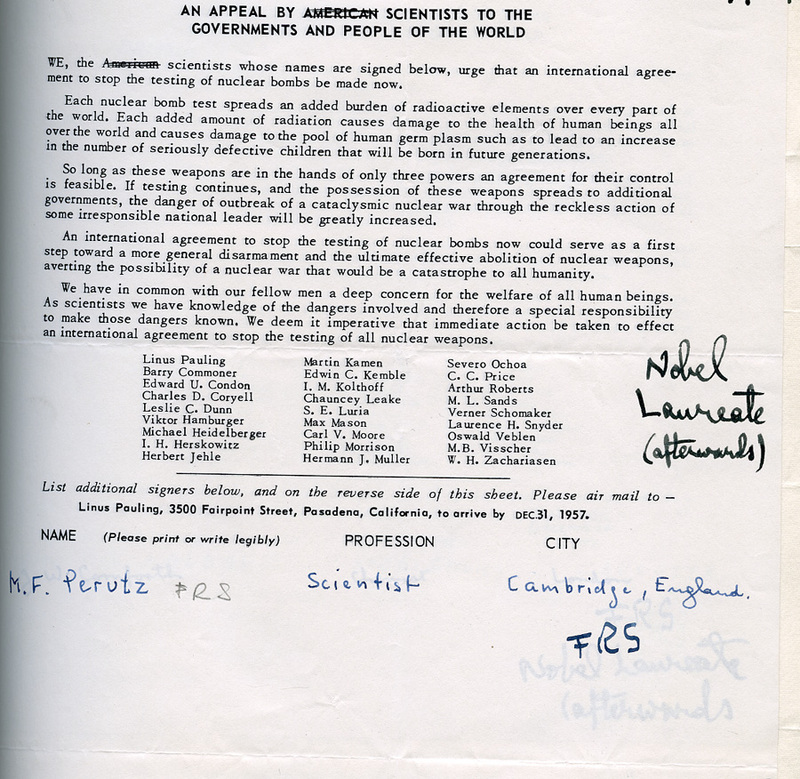 Weiss’s conclusions were published in a 1964 article, “Nature of the Iron–Oxygen Bond in Oxyhæmoglobin”. According to Weiss, the iron in hemoglobin would need to be in the ferric state (iron with an ionic charge of +3) in order to account for hemoglobin’s behavior in oxygen transport. He believed that ferric iron would also explain hemoglobin’s spectroscopy (the wavelengths of light reflected by a molecule). Pauling, however, disagreed with Weiss. 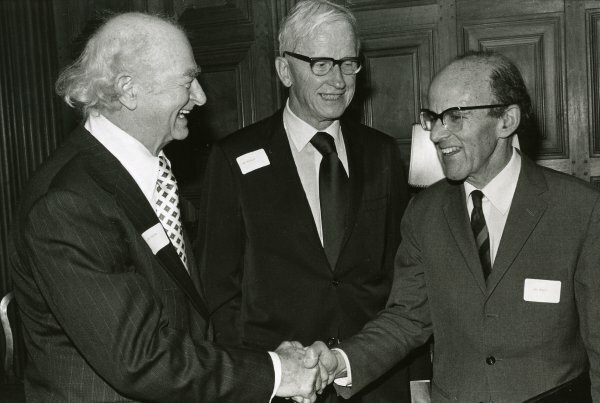 Pauling, Max Delbruck and Max Perutz, 1976. 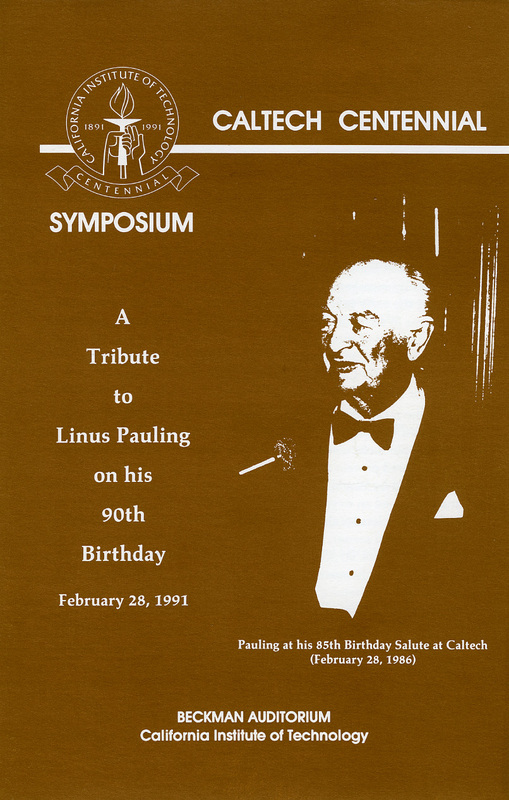 Interestingly, Pauling had been looking into the subject of the iron-oxygen bond in hemoglobin since 1948, when he presented a paper titled “The Electronic Structure of Hemoglobin” at a symposium in Cambridge, England. 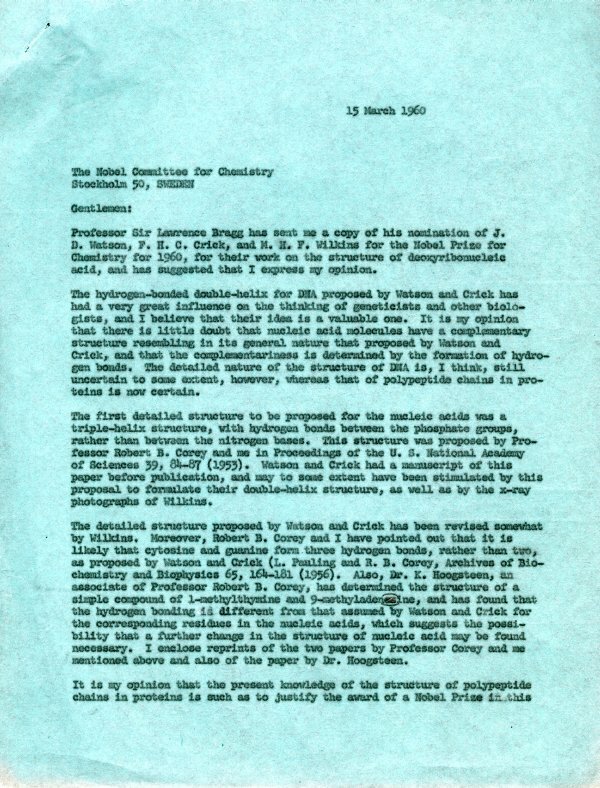 Pauling’s presentation considered advances in x-ray diffraction and quantum mechanics to propose a structure for the heme group in the protein. Unlike Weiss, Pauling believed that the iron-oxygen bond in oxyhemoglobin would require ferrous iron (an iron with an ionic charge of +2) to form a double bond (a bond involving two electrons) with oxygen as it was being transported throughout the body. 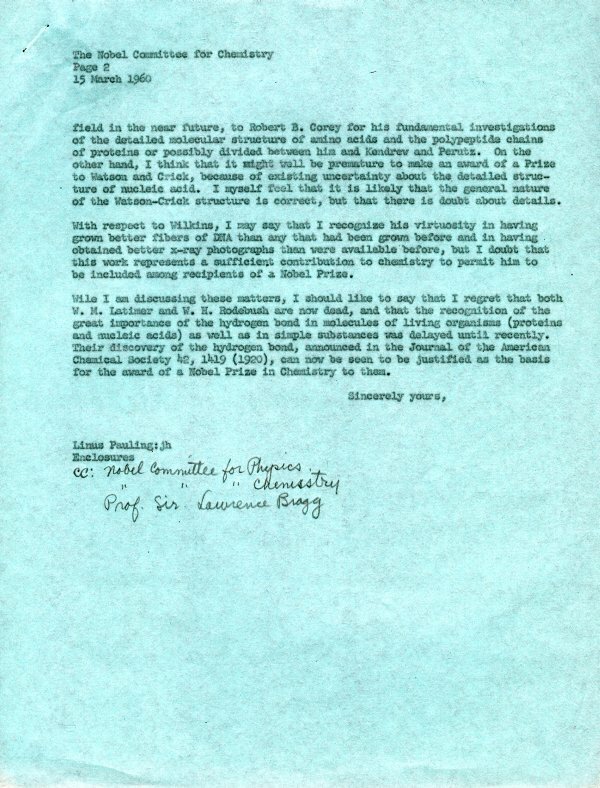 Weiss’s paper did little to change Pauling’s mind on the subject. 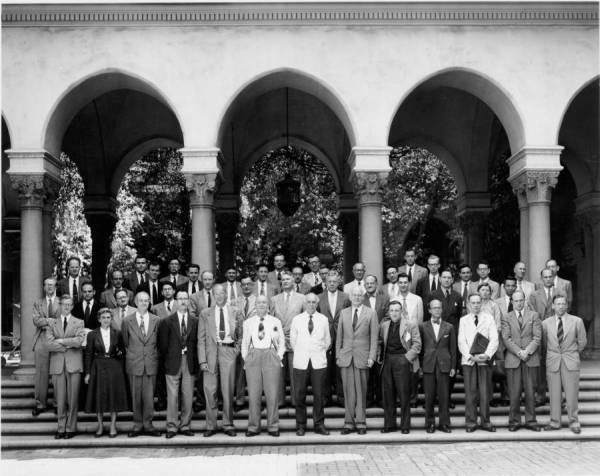 even the great amount of work that would be needed for a complete determination of [hemoglobin’s] structure, involving the location of each of the thousands of atoms in its molecule, would be justified. 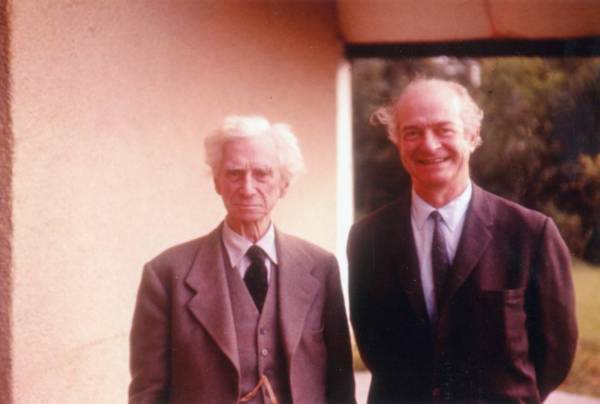 Many years later, in his 1992 article “The Significance of the Hydrogen Bond,” Max Perutz stated that that Pauling’s words, as published in 1949, were among the inspirations propelling his own work a decade later. 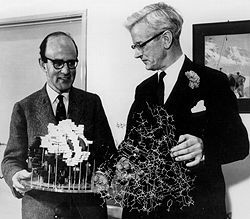 “The Electronic Structure of Hemoglobin” wasn’t the only publication by Pauling that inspired Perutz. 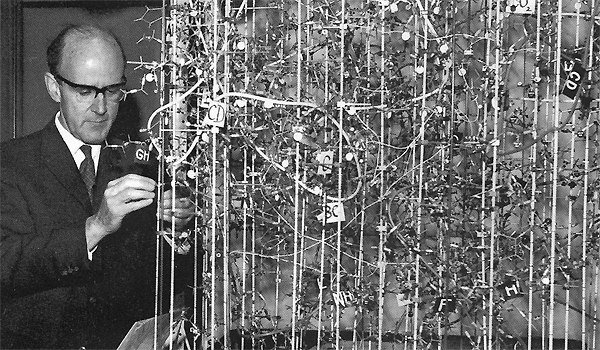 In 1970, he used Pauling’s “The Magnetic Properties and Structure of Hemoglobin” to further his own study of the structure of hemoglobin, work which finally led to the discovery that the iron-oxygen binding in hemoglobin depends on the electronic spin transition of the iron atom. 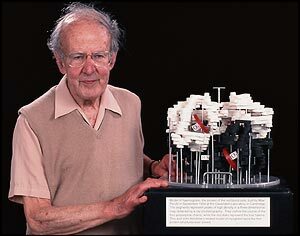 Essentially, Perutz found that when the ferrous iron in hemoglobin is in a low spin state, its higher d-orbitals are unoccupied by electrons, which allows oxygen to form a bond with iron. In a high spin state, the electrons in ferrous iron are occupying all d-orbitals in the atom and oxygen remains unbound. This suggests that the more likely structure for hemoglobin involves a single bond between iron and the oxygen molecule, not the double bond that Pauling had proposed in 1948 and again in 1964. 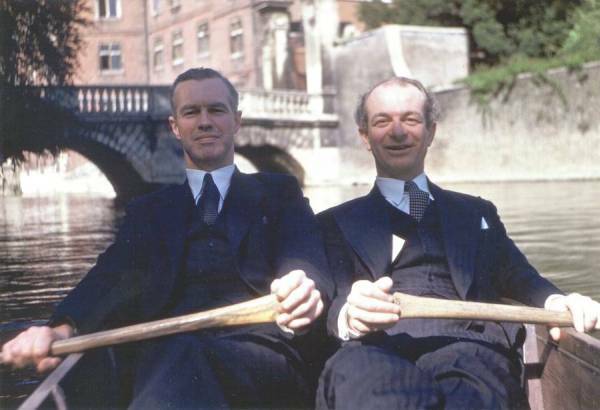 But Pauling was correct with respect to the presence of ferrous iron in the compound, and he had been able to make this determination before any crystallographic pictures were available to him.